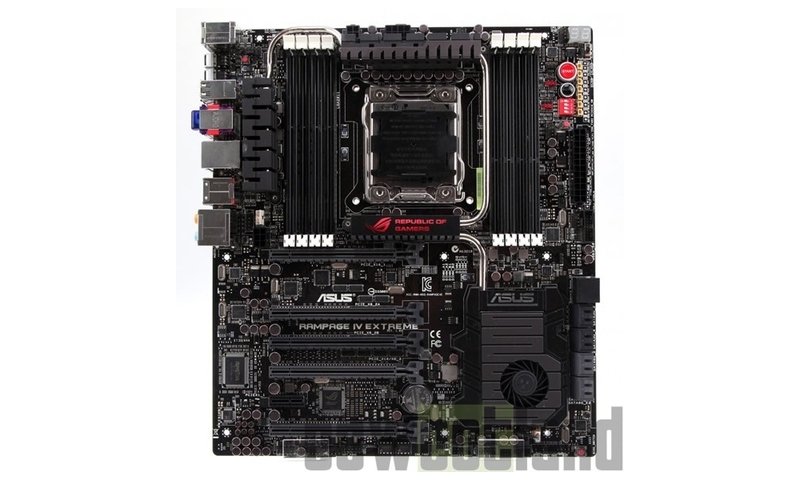 Anyone who saw the ROG Rampage IV Extreme knows just what kind of overpowered motherboard it is, even among high-end platforms. The Republic of Gamers (ROG) brand is basically defined by overkill really. Still, whether in spite or because of that overkill, the hardware usually has no trouble selling. Occasionally, this makes ASUS think it is a good idea to refresh them, like now: the ROG Rampage IV Extreme has been colored black, and given the name Rampage IV Extreme Black. The PCB and most everything on it (not counting the silver/grey contacts, of course) are black, with just a few red accents thrown into the mix. For those not familiar with the Rampage IV Extreme, the motherboard supports Core i7 Intel CPUs (LGA 2011 socket, X79 chipset), 64 GB of memory (quad-channel DDR3 memory), four-way SLI/CrossFire multi-gpu setups and overclocking. Pricing and availability are still to be announced. via Cowcotland.